How do we do this boldly? By being a round peg in a square hole. That’s about as clear as mud, right? Here is what I mean. You will, even today, be given at least one opportunity to take a stand for Christ, in Christ. Not necessarily in a bold evangelical, accept-God’s-gift-of-salvation kind of way (although He does provide those on occasion.) Instead, we can be bold in showing, love, joy, peace, patience, kindness, goodness, faithfulness, and self-control. This is choosing the high road when it would be so easy to just go with the flow and follow the crowd. This is choosing what is right over what is painless. This is choosing acceptance over anger, forgiveness over bitterness. This is choosing truth over lies, no matter what the consequences. This often creates waves, draws attention, and always requires courage. Wherever you go, whatever you face the Lord is with you. 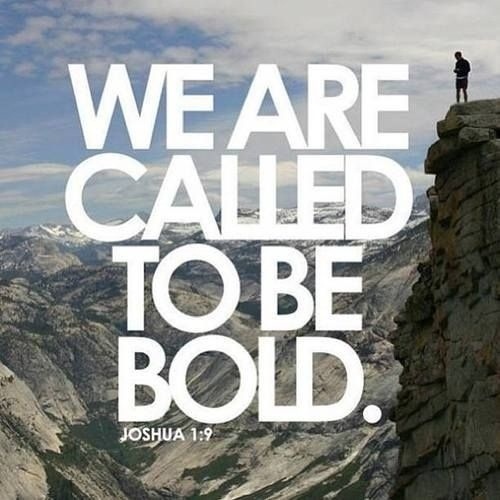 So go boldly and with confidence knowing you are not alone. As the Apple ad said, if you are one of the “crazy” people who stand out from the crowd, be prepared because people will quote you, disagree with you, glorify or vilify you. Just don’t let them ignore you and never settle for status quo. And always believe that you can change things, one bold act at a time.